Alex De Minaur can really rise up the rankings with his excellent run in Shanghai. 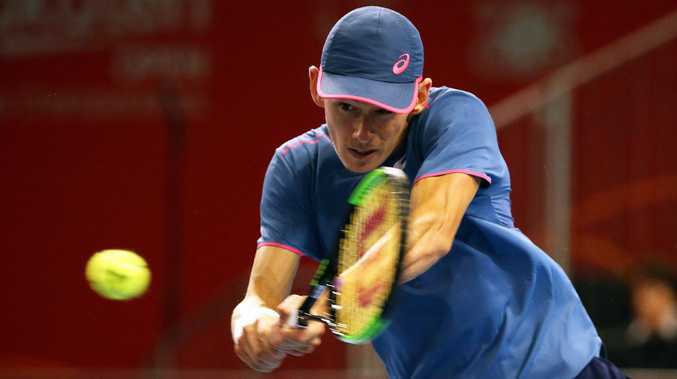 ALEX de Minaur has set up a tasty third-round encounter with Alexander Zverev after a straight sets win at the Shanghai Masters on Wednesday. The Australian eased to a 6-4 6-3 win over Frenchman Benoit Paire as his late season run gains momentum. Already at a career high No.33 in the world, the 19 year-old is eyeing off more rankings points as he closes in on a seeding at next yearâ€™s Australian Open. It is his first third round appearance at a Masters series event, the highest rated tournaments outside the grand slams. Standing in his way of a quarter-final appearance is German Zverev, who enjoyed an impressive second round win over in-form Georgian Nikoloz Basilashvili 7-5 6-4. World No.5 Zverev had too much in the tank for de Minaur in the Washington final back in August where he won in straight sets, but the Australian pushed him to a fifth set tiebreaker at the Davis Cup earlier in the year. Kyle Edmund was another early winner on Wednesday, the Brit downing Andreas Seppi 6-3 6-4.